ams AG has announced the AS7221 Spectral Tuning IoT Smart Lighting Manager, which integrates CCT, or “Kelvin-tuning,” capabilities for smart LED lighting manufacturers. The device provides color point tuning that controls CCT transitions between configured LED strings, with spectral tuning provided via direct PWM channel outputs. An embedded tri-stimulus CIE XYZ color sensor enables direct mapping to the CIE 1931 color space, and an included I2C interface enables communication of other sensor readings such as air quality, temperature, and occupancy, which allows the AS7221 to function as an IoT sensor hub. 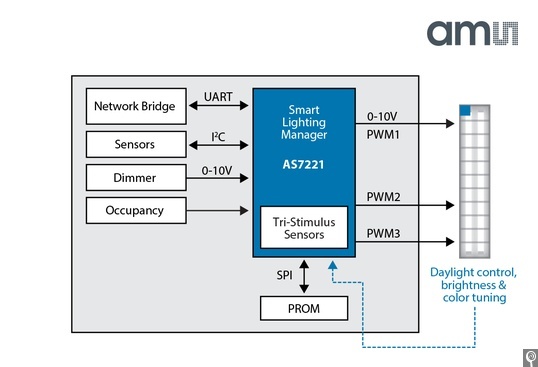 A Serial UART connection on the AS7221 equips the device for wireless connectivity and network control through a Smart Lighting Command Set that supports standard wireless clients, including Bluetooth Low Energy (BLE), ZigBee or Wi-Fi. Compatible with standard 0 V to 10 V inputs, the device also includes automatic configuration support for ams’ TSL4531 ambient light sensor. “The next generation of lighting will be defined by three key characteristics: controllability, adaptation and connected architectures,” said Tom Griffiths, Senior Marketing Manager at ams. “With this latest entry, we are addressing the luminaire manufacturers’ critical time-to-market challenge for developing and deploying a spectrally tunable luminaire that is cost-effective, accurate, and which smoothly integrates into the Internet of Things”. The AS7221 is provided in a 5 mm x 5 mm LGA package, and available now in production volumes. For more information, visit www.ams.com/Spectral-Sensing/AS7221.